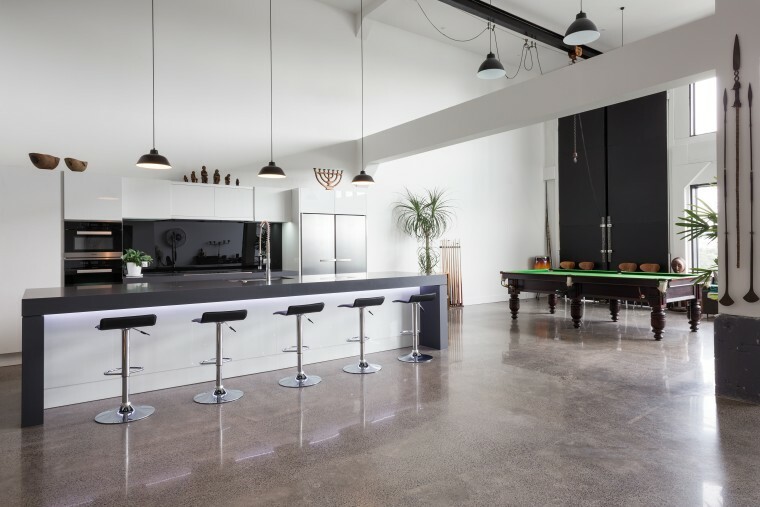 Part of a greater warehouse conversion, this kitchen both downplays its function and also stands out as a bold composition. Creating an upstairs kitchen for a warehouse conversion doesn't necessarily mean running to your check-list for semi-industrial materials. 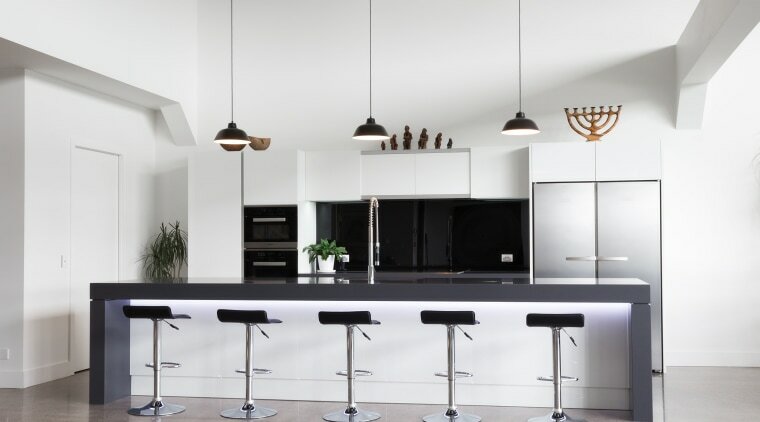 This clean-lined, black and white kitchen by designer Lara Farmilo responds to the scale of its setting, but the look is sleek and minimalist. 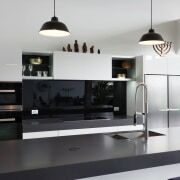 The kitchen is a balanced composition of white cabinetry, black ceramic benchtops, a black back-painted glass splashback and satin stainless steel seen in the matching fridge and freezer appliances, and accents on the wall ovens. 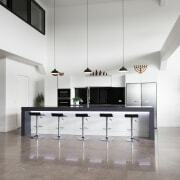 This kitchen is positioned a reasonable distance from the dining area, so the placement of stools in front of the island to create a social gathering point was important. "To an extent, the kitchen is intended to disappear into the white of the greater space," says Farmilo. 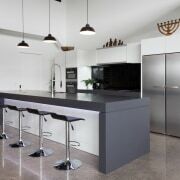 "However, the island's waterfall benchtop does make for a strong sculptural statement. 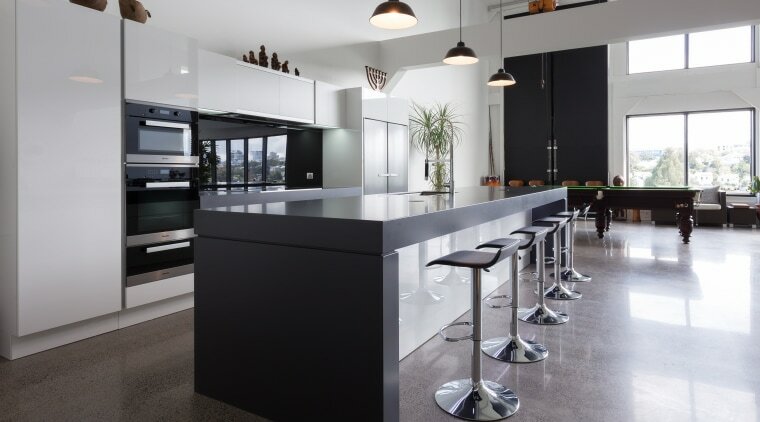 Adding a negative detail between the benchtop and legs lightens its bulk slightly." Every modern convenience is included, such as electric push-to-open cabinet hardware a feature particularly useful on the high display cabinets over the cooking area and refrigeration. This and the negative detail handles on other cabinets contribute to the crisp, detail-free look. LED lights above the cabinets and under the island benchtop bring added atmosphere to this kitchen at night. 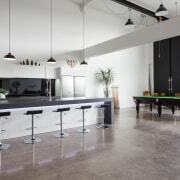 The concrete floors are original. The room's height is accentuated by uplights over the top cabinets matched by downlights under these cabinets and under the island bench.